My family wasn’t really good at pets. We had lots of animals in our lives, but most of our pets were birds–as in ducks. Not your typical pet. After living with us for a few years, the birds were usually rehomed (as the term is now) to farms with larger flocks. My family did go typical once when my parents got us a puppy. Four little kids (I think we were all younger than 10) and a rambunctious puppy ended up being too much for my parents. They rehomed the dog. I still remember how my stomach hurt for weeks and weeks after losing my dog. It still hurts today decades later when I think of him. (And I hope in writing this post I don’t hurt my parents’ feelings). 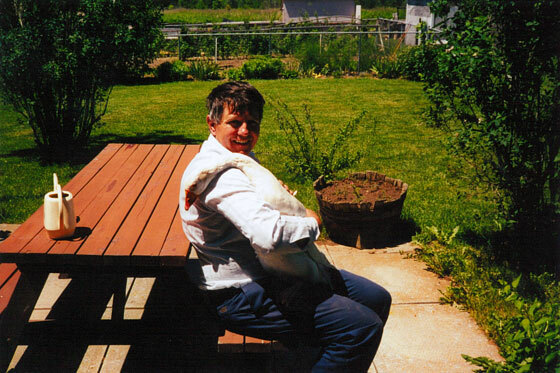 I’m sharing this story to explain how, several years after the puppy, Bill the goose (gander) went from a family bird (which you saw in Part 1), to my pet, to a family pet once again (below, my Dad with Bill). We’d had Bill for a few years. His duck friend Magellan had disappeared one spring night, and he’d been alone for a little while. My Dad, who’d been taking care of him, mentioned that he thought it was time that he found a farm for Bill. Now, I’m sure my parents thought there was no way I would stick with it. 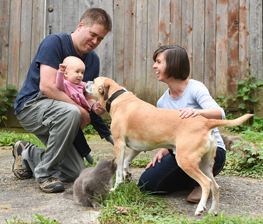 However, getting rid of our dog affected me more than they realized. There was no way I was letting them get rid of Bill. I did exactly what my Dad said. Every afternoon when I came home from school, I would go to the pen in the backyard and let Bill out for a wander. We’d walk around the coop so that we had a straight shot from the backyard to the front yard. Then I’d start running. Bill would open his big white wings and run behind me. He was an Embden, a breed that is primarily raised for meat. He was not the best flyer, but if the wind was right he could sometimes get up as high as my shoulder. Once in the front yard, Bill would decorously fold his wings along his back, and the two of us would walk down the road. At the corner, we’d turn around and come home. After awhile, it was just accepted that Bill wasn’t going anywhere. He got a new duck friend, Buster. He got his summer trips to the cottage every weekend. 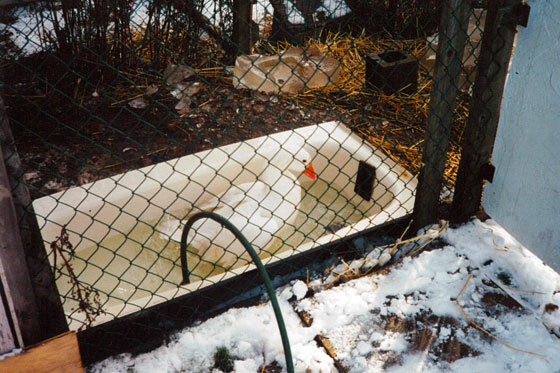 He got a bathtub in his pen so he could swim whenever he wanted. When I got my first boyfriend–Matt–he got to take care of Bill when my family went camping (thank you, Matt). Bill became, once again, the family’s pet. Geese can live 20 years or longer. Bill was nowhere near that old when he died. Maybe 7. I’m not sure now. One day, he stopped eating. I tried hand feeding him, force feeding him, bringing him inside for a warm bath (it was winter and his outdoor bathtub–which he loved–had been drained for a few months). Nothing roused him. Even though he was the family’s goose, at the core he was mine. So when I made the decision not to take him to a vet, my Dad didn’t try to change my mind. 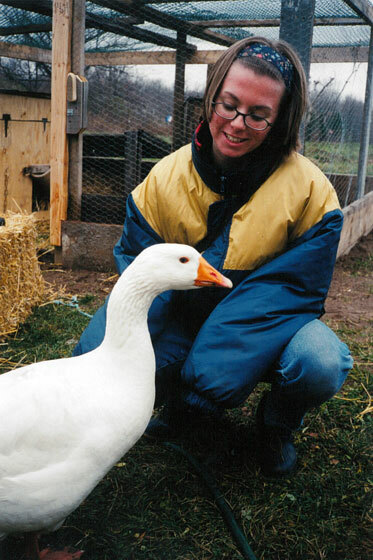 This was pre-internet, and searching for a vet that would treat a goose was much more challenging than it is today. As well, I still considered Bill a farm animal, and as harsh as it sounds I have different standards for farm animals than I do for other pets. When Bill died, my Dad was very upset. He felt he should have found a vet for Bill. I remember my Dad tearing up as we stood over Bill’s grave in the backyard. This demonstrated that Bill was truly a family pet. And maybe that’s why for the most part I was okay (although I’m sniffling and crying now as I write this). Bill had got to live out his life with his family. His whole life. And that’s all I wanted. This goose (gander, really) and my long-ago little dog ended up being big forces in my life. They influenced how I thought about adopting a dog. They influence how I care for Ralph and Baxter now. Bill is the reason I want to have my own birds here at the farm. And you saw last week that Bill even influenced my choice of art for this house. The papier maché goose is a great way to commemorate him. Very sweet story. Bill was a great pet. He was a great pet. Aww, what a beautiful story Julia. It doesn’t matter the species, a pet is family. That’s true. A goose may not be a traditional pet, but Bill was a great one. Oh wow, what a beautiful story and tribute to Bill. I just read your two stories about him, and the post about your recent papier-mache goose purchase. I have to say I have never spent enough time with any type of bird to ever form an attachment, so I can’t imagine having them as pets. But I could really understand your love for Bill. It sounds like he was a very special pet. Thanks, Lindsay. He was my only true pet. A bit unconventional, but a pet nonetheless.